Located west of District 1, Saigon’s Chinatown is definitely one of the city’s must-visit neighborhoods. Known to locals as Chợ Lớn (also spelled Cholon or Cho Lon online) and covering large areas of District 5 and District 6, it’s history dates back to the late 18th century when immigrants from China began to populate the region due to political strife back home. This has resulted in great culinary and cultural diversity ranging from dumplings and flamboyant temples. Staying at a boutique hotel in Saigon means that your connection to Saigon’s Chinatown is a mere 30 minutes taxi ride. Here’s a list of venues that should not be missed. One of largest markets in Vietnam and a point of pilgrimage in Chợ Lớn, this eye-catching structure will open again in November 2018 after an intense two-year renovation. A street food heaven knew for its ample supply of Hong Kong-style roasted duck and crispy pork, you’ll find Cafe Ba Lu which has achieved a cult-like status for their addictive and strong sock-filtered coffee brewed using home-roasted robusta beans. Built in the 1930s by Tamil Muslim, Chợ Lớn Mosque now serves Muslims from all nations residing in Ho Chi Minh City. 641 Halal restaurant smacked right beside the mosque has a big secret to hide; one of the city’s best mutton curries. The name of this Buddhist temple describes itself rather aptly; it’s fifth level is home to approximately 10,000 Buddha statues of different sizes. 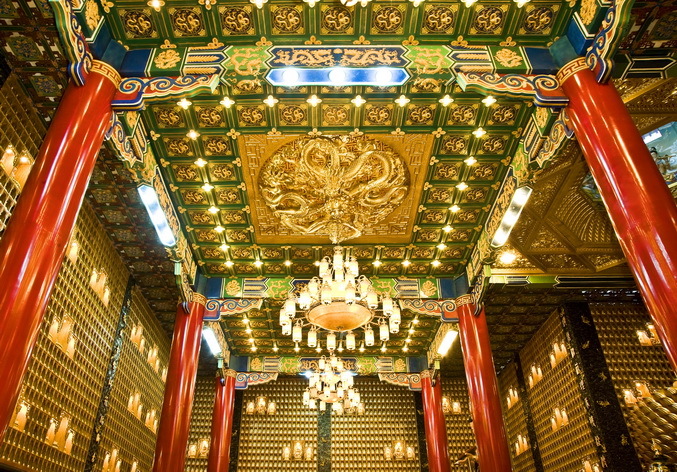 Built by early southern Chinese immigrants and reminiscent of Chinese temples in Taiwan and Hong Kong, the humongous spiral incense hung on the ceiling of the temple is an Instagram-worthy sight. This historical Chinese restaurant serves up delicious bowls of wanton and duck noodles. Duck legs are first fried then braised till tender and served together with Cantonese noodles in a luscious herbal soup. Nothing beats a hearty hotpot consisting of fish, squid, shrimp and other mouthwatering ingredients heated over glowing charcoal.